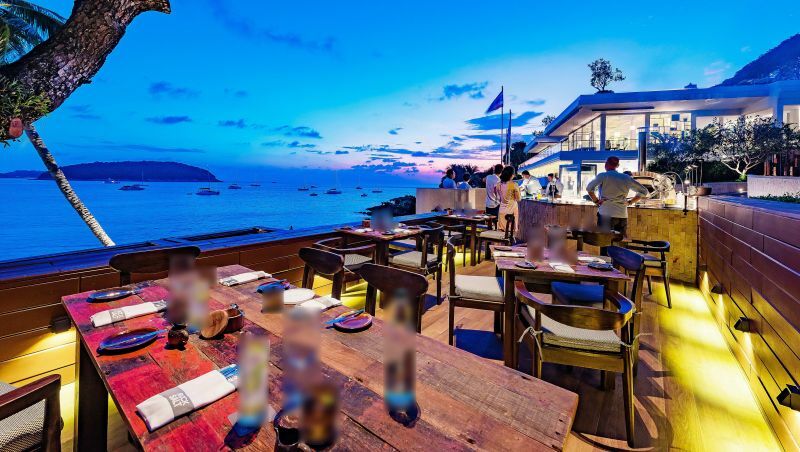 I thought I would begin by wax­ing lyrical about the view from Prime, the latest restaurant from The Nai Harn stable. However, Prime is open for dinner only, so if it’s a breathtaking sunset you are after, you may equally visit Cosmo or Hansha, the hotel’s oth­er restaurants, where the view is argu­ably more impressive due to the added elevation. The menu explains Wagyu and marble scoring. Firm and succulent Hebridean salmon. Prime is open-air yet intimate too. For me, spectacular ocean views are best experienced during the day. Visit Cosmo for the newly launched Sunday brunch, or Rock Salt, where one can enjoy fresh seafood and Thai specials whilst savouring the beachside location. Without taking anything away from the high quality of food or incredible creativity to be discovered at these other restaurants, Prime is where you go for truly exceptional ingredients and, in my opinion, a culinary experience. Prime is open-air, rustic and, with only 14 seats, intimate. Stretching along one edge is the kitchen, the centrepiece of which is a custom-built wood-fired oven, majestically dominating the compact but well-equipped space. Mark Jones, the Ex­ecutive Chef at The Nai Harn, is at the helm of his new baby. With a background in celebrated Michelin-star restaurants, he looks particularly at home within this dramatic setting. The restaurant is described as the home of smoke and fire the menu out­lines this philosophy as well as the provenance of each and every premium product with a narrative helpfully ex­plaining Wagyu and marble scoring. I am suitably impressed! The menu itself, whilst not extensive, has more than enough choice to tempt. I begin with Spanish octopus, cooked sous-vide to ensure it is cooked evenly and both flavours and moisture remain. It is then chargrilled and served with skor­dalia and gremolata. The former a rich garlic and potato purée, the latter a herb and citrus dressing. 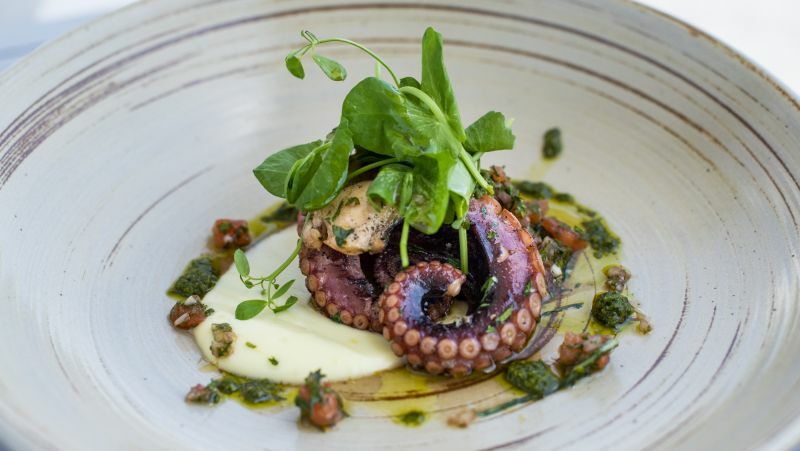 The octopus, with a perfect light char, is both tender and flavourful and the accompaniments both compliment and accentuate the taste. This is followed by a further appe­tiser of cold-smoked Hebridean salmon. 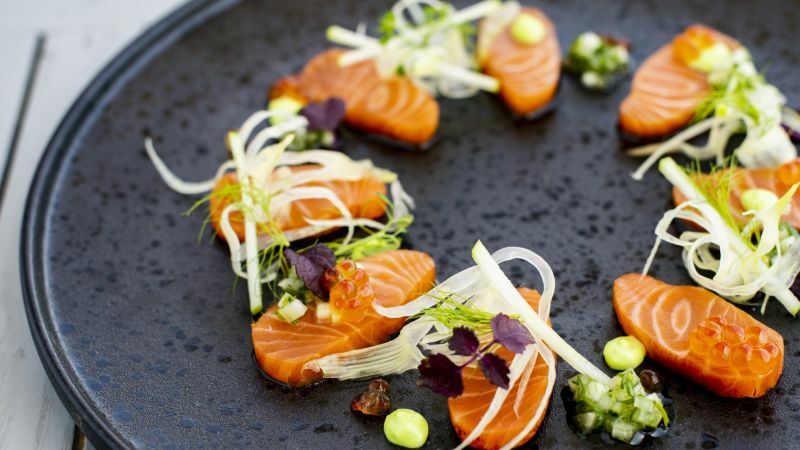 Grown in the cold and stormy waters of the Scottish North Sea, the salmon has a firm and succulent texture and distinc­tive taste. The menu also features an impressive high-end pairing along with an encyclopedic list from around the globe recommended by James Suckling, the internationally-renowned critic, with helpful tasting notes. 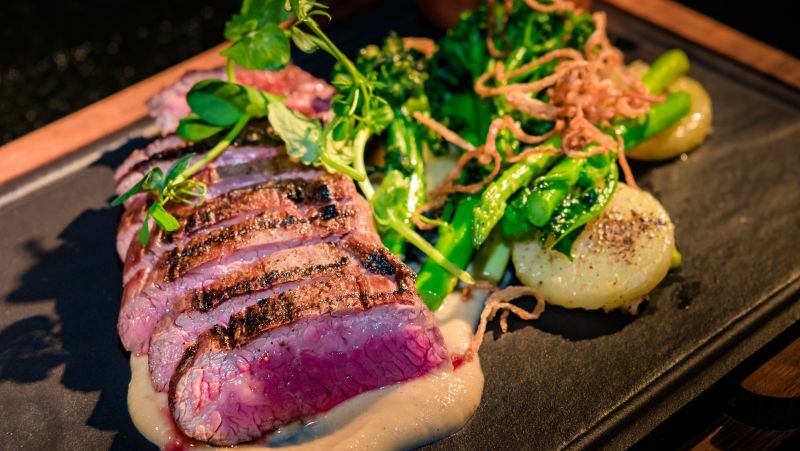 Moving on to main courses, the star of this restaurant is the calibre of premi­um beef. There are a number of options, several to share, such as 48-hour slow-cooked short ribs or a 270-day grain-fed, dry-aged black onyx Angus côte de boeuf. Cooking the perfect steak, even when provided with a prime (no pun intended) cut of beef, is not that easy. It requires talent, patience and love, all of which Mark possesses in abundance. I go for a Rangers Valley Wagyu rib eye with a marble score of six. This Aus­tralian cut is raised in the cool climate of the New England Tablelands and then finished on grain for 360 days. It is served up with truffle mashed potatoes, charred romanesco cauliflower and a red jus. The meat arrives charred on the outside, offering a perfect crust whilst perfectly pink within. It’s almost butter-like in texture with a slight bite and explodes with flavour. The purée creamy, buttery and earthy all at the same time; the cauliflower adding a welcome crunch, the jus concentrated and made to marry the meat. With Mark’s gentle persuasion, I sample a further main course: the Red Label young yellow chicken. A marinated poussin arrives at table surrounded by a tasty pancetta and white bean fricassee, wild mushrooms and charred broccoli. It truly looks like a picture! The chicken is imported from Rungis Market in Paris. The birds are corn fed, hence the yellow colour and the truly mouth-watering fla­vour of the meat. To complete my evening, I choose a triple chocolate brownie sundae com­posed of dulce de leche layers coating a crumbly chocolate biscuit with raisin ice cream infused with a Chalong Bay liquid. Prime, as one has come to expect from The Nai Harn, is staffed with effi­cient and engaging waitresses. The food is fantastic and, whilst the prices are not your everyday, is nevertheless affordable for this quality. My advice: book soon; forego lunch; and arrive early, not for the view, but to allow time to peruse the menu and its stories. And the day after dining, ask yourself where else in Phuket can you truly experience this quality of imported fish and meat? I had a prime time! Prime is open for dinner only.